Designed to combine a coupe-like silhouette with the luxurious interior of a BMW 7 Series, while at the same time offering the functionality of a BMW 5 Series Touring or X5. It's nearly as long as a BMW 7 Series to create a greater feeling of space for those inside. This translates into the second greatest amount of legroom offered by any BMW while headroom is equivalent to a BMW X5. By folding the back seats, bootspace can be increased from 440 litres up to 1700 litres. The 5 Series GT comes as either a four-seat Executive specification model for a luxurious, spacious feel or as a five-seat SE. The two-piece tailgate (like a Skoda Superb) is a first in the premium market offering both a conventional saloon opening, or a hatchback in the same car. The rear seats can be moved 100mm to either increase boot space or provide greater legroom for rear seat passengers. With the rear seats moved forwards, the seat backs folded virtually flat and with the parcel shelf removed and stowed beneath the luggage compartment floor, much bulkier items be transported. One of the key features of the BMW 5 Series Gran Turismo is the height of the seats. Potential customers have expressed a desire for the luxury of a BMW 7 Series but also the feeling of security and all round visibility a car with a command driving position such as the BMW X5 offers. Black Panel technology is a piece of design that allows the displays of the centre console to double as a stylish trim. The electronic displays are visible through the Black Panel when needed, but are discreet enough to form a stylish black band across the interior. Control switches in galvanised metal are set into the centre console by way of contrast. Three engines power the three models available when it was launched - a 530d, a 535i and a 550i, The biggest seller is the BMW 530d GT. This 2,993cc six cylinder car features common-rail direct injection for refinement and efficiency. Producing 245hp at 4000rpm, the 530d accelerates from 0 to 62mph in 6.9 seconds before going on to a top speed of 149mph. The peak torque of 540Nm from just 1750rpm provides smooth yet swift progress in any gear. Fuel economy 43.5mpg and CO2 emissions are 173g/km. The BMW 535i GT 2,979cc six-cylinder powerplant is the first ever to combine a single turbo with Valvetronic - BMW’s system that varies how much the engine’s valves open for optimum efficiency. This 306hp model also features High precision direct injection technology for added efficiency. The performance credentials of the car are underscored by a 0 to 62mph time of 6.3 seconds and an electronically-limited top speed of 155mph. Consumption and emissions figures are impressive with 31.7mpg on the combined cycle and CO2 emissions of 209g/km. The range topper is the 550i GT. Powered by a 407bhp 4,395cc V8 engine with twin-turbo technology, the 550i GT offers near supercar performance with a 0 to 62mph time of 5.5 seconds and an electronically-limited 155mph top speed. Its twin-turbochargers provide a near flat torque curve to provide relaxed yet rapid in-gear acceleration. Peak torque of 600Nm is on hand from 1,50rpm through to 4500rpm. The BMW 550i GT has a combined consumption figure of 25.2mpg and CO2 emissions of 263g/km. All BMW 5-Series GTs come as standard with BMW’s new eight-speed automatic gearbox. The all-new transmission is six per cent per cent more fuel efficient than the previous six-speed automatic yet it is as compact and weighs the same. The BMW 5 Series Gran Turismo comes with many of the EfficientDynamics technologies already shown on other BMWs. Brake Energy Regeneration which recharges the vehicle’s battery during engine over-run is standard. On-demand control of the car’s ancillary units such as the electrical coolant pump and the powering steering pump can all be decoupled to save draining power from the engine. Active aerodynamics also plays a part in the range’s performance and efficiency by closing off flaps behind the kidney grilles to improve the aerodynamics of the car. All BMW 5 Series GTs come as standard with Drive Dynamic Control, a feature first showcased on the BMW 7 Series, that allows the driver to fine tune the chassis configuration to suit their needs. Drivers will be able to specify Normal, Comfort, Sport and Sport+, with each setting changing the steering assistance, throttle response and gear change characteristics. Dakota leather upholstery, four-zone air-conditioning, panoramic sunroof and metallic paint are standard along with a USB audio interface, ambient lighting and heated front seats. Features such as Reversing Assist Camera and Side View camera capability are available as options. The Reversing Assist Camera works in conjunction with the Park Distance Control system to provide a 360 degree picture of the car when manoeuvring at slow speeds. The Side View camera option allows drivers to pull out of blind junctions with confidence. 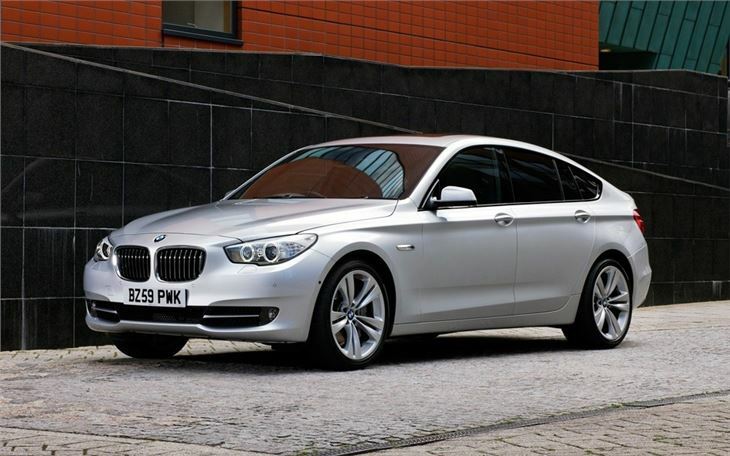 The BMW 5 Series Gran Turismo went on sale on 24th October, 2009. The BMW 5 Series Gran Turismo is now being offered with enhanced standard specification, offering drivers superior luxury for up to £1,770 less. Building on its luxury roots, all BMW 5 Series Gran Turismo models will now come generously equipped with BMW Professional Navigation System, BMW Assist, electrically adjustable front seats with driver memory, Voice control, Xenon headlights with headlight wash and remote tailgate operation as standard. 19-inch light alloy M V-spoke wheels, front Sports seats, door sill finishers with M designation, M aerodynamic bodystyling, M Sport multi-function leather steering wheel, M Sport suspension, high-gloss Shadowline exterior trim, dark chrome tailpipes and Anthracite headlining. BMW Gran Turismo ownership now starts with the new 520d Gran Turismo, powered by the same 2.0-litre TwinPower Turbo diesel engine fitted to the 5 Series Saloon and Touring. It develops 184hp and 380Nm of torque and, thanks to a full complement of EfficientDynamics measures, including Auto Start-Stop and ECO PRO mode, the 520d Gran Turismo is capable of 53.3mpg, with CO2 emissions of just 139g/km. This puts it in VED band E ensuring a BIK rate of 21 per cent. Standard equipment includes Dakota leather upholstery, an eight-speed automatic transmission, the BMW Business Advanced Navigation system and enhanced Bluetooth telephone functionality with telematics. A panoramic sunroof, heated front seats, Park Distance Control front and rear and automatic tailgate operation are further specification highlights. The 530d Gran Turismo is available in SE or M Sport from £36,605 OTR. At the same time the 520d engine arrives, all other versions of the 5 Series Gran Turismo gain Auto Start-Stop and ECO PRO which brings down their BIK rating by up to 5 per cent, while the 530d, 535d and 550i exhibit significant gains in power and torque for improved performance. The 530d now develops 258hp and 560Nm – increases of 13hp and 20Nm – yet fuel consumption improves by 5.2mpg to 48.7mpg and CO2 emissions are down by 20g/km to 153g/km. The 535d gains 13hp and 30Nm to take it up to 313hp and 630Nm, but at the same time there is a 5.7mpg combined economy improvement, now 47.9mpg, and CO2 emissions fall by 21g/km to 154g/km. The 550i develops 449hp and 650Nm– an extra 42hp and 50Nm – but CO2 emissions are down by 49g/km to 214g/km and fuel consumption is 5.5mpg better at 30.7mpg. The power and torque figures of the 535i Gran Turismo are unchanged, but the addition of the new EfficientDynamics measures bring about a 17g/km reduction in CO2 emissions to 192g/km while improving fuel economy by 2.7mpg to 34.4mpg. There are modest price rises of £375 for the 535i, £495 for the six-cylinder diesel models and £870 for the 550i. All versions of the 5 Series are more fuel-efficient building on EU6 emissions capability that is standard far ahead of the legislative requirement of September 2014. All petrol versions of the 5 Series also meet the EU6 regulations. They include a new 4.4-litre twin-turbocharger direct-injection V8 for the 550i Saloon, Touring and Gran Turismo. The new V8 develops 449hp and 650Nm - increases of 42hp and 50Nm over the previous unit -­ with significantly lower fuel consumption and CO2 emissions of 32.8 mpg and 199g/km, depending on wheel and tyre. The BMW 550i Luxury Saloon costs £57,165 OTR, the Touring is £59,635 OTR and the Gran Turismo version is £59,060 OTR. The network of intelligent ConnectedDrive technologies has been expanded in the new 5 Series range to advance the safety, connectivity and convenience of both drivers and passengers. The BMW Business Navigation system becomes standard on all new 5 Series Saloon and Touring models. The 5 Series Gran Turismo family maintains Business Navigation on all four-cylinder variants with the upgraded Professional Navigation system available as standard on all six-cylinder models. The Gran Turismo has a new front air intake and an extended tailgate which ensures the roof blends more harmoniously into the rear end. An additional benefit is that it increases boot capacity by 60 litres to 500 litres. Light and shade effects around the number plate mounting, a sweepng crease extending into the flanks and a chrome strip in the rear apron give the rear of the Gran Tursmo a sportier look, accentuated by new horizontal lights with LED strips. All models now have chrome strips bordering the central Control Display in the cabin, and the Saloon and Touring have larger storage areas and cup holders. The Comfort Access system can now close as well as open the boot or tailgate by a movement of the driver's foot beneath the rear apron. There are new paint and alloy wheel options, and new Luxury and Modern models to increase the range of personalisation possibilities. The BMW Gran Turismo range now starts at £37,605 OTR for a 520d SE rising to £60,010 OTR for a 550i M Sport.